When Kate Courtney won America’s 2017 Cross-Country National Championship, she did it in commanding fashion. She beat the next fastest racer in the women’s pro class by more than four minutes. That is a huge margin! the world, and she beat all of them, including two-time UCI world champion Catharine Pendrel of Canada. What’s more, Kate also beat Olympic gold medalist Jenny Rissveds of Sweden, the most celebrated women’s mountain biker in the world in 2016.
Who is Kate Courtney? Where did she come from, and what kind of super-fast bike is she riding? Read on to find out. Kate: Lawyer and stock analyst. Kate: I learned to ride at a very young age from my dad, but didn’t learn to ride a mountain bike until age 6. I rode trails for the first time on the back of a tandem with my dad. MBA: If you competed on other bikes before mountain bikes, what kind of bikes? When did you do it, and how well did you do? Kate: My first mountain bike was a red and white Specialized Rockhopper, which I still have, that I got when I was 6. Kate: I started competing when I was a freshman in high school as part of the Branson High School mountain bike team. My first race was in Fort Ord as part of the NorCal League. Kate: I was a 10-time Cat. 1 and colle- giate national champion in STXC and XC, two-time Pan American champion, two-time Junior World Cup winner and three-time U23 World Cup winner. Kate: National champion! Sea Otter Classic win and four-time U23 World Cup winner. MBA: Where did you go to college and what was your major? Kate: Stanford University, human biology. Kate: Cross-country running, ski racing, horse jumping. Kate: It has been slightly unusual to be both a full-time student and professional athlete for the past four years. Now that I have graduated, I am really looking forward to focusing full-time on my athletic pursuits. Kate: My spirit animal is a shark. They are generally pretty easygoing, never stop moving, eat constantly and know when to attack. Jobs held (other than racer): Finally graduated from Stanford and now just a bike racer! a racer: My degree is in human biology with a concentration in global health and technology innovation. Most likely I would be working in the field of healthcare technology, but not exactly sure—and I don’t want to find out! 1. Frame: 2018 Specialized S-Works Epic, carbon material, 100mm travel front and rear. 2. Fork: RockShox SID World Cup with Brain damper; 100mm travel, settings change based on course. 4. Inner tubes or tubeless system: tubeless. 5. Rims: Roval Control SL. 6. Spokes: DT Swiss Revolution, straight pull. 7. Front hub: Roval Control SL. 8. Rear hub: Roval Control SL with DT Swiss star ratchet driver. 9. Brakes: Magura MT8 Raceline. 10. Handlebar: Specialized Prowess XC flat, carbon 640mm. 11. Bottom bracket: CeramicSpeed BSA 30. 12. Grips: ESI Racers Edge 30mm. 13. Cranks: “Rotor REX1 power meter, 170mm. 14. Chainring(s): Rotor NoQ 32-tooth. 15. Pedals: Crankbrothers Eggbeater 11s. 16. Chain: CeramicSpeed UFO-treated SRAM Eagle, 12-speed. 17. Rear derailleur: SRAM XX1 Eagle 12 speed. 19. 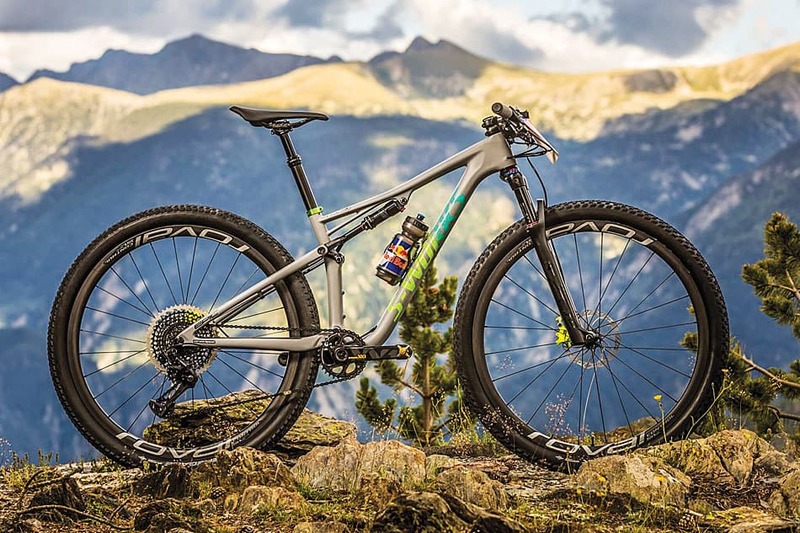 Shifters: SRAM XX1 Eagle 12-speed. 20. Brake levers: Magura MT8 Raceline, carbon. 21. Rear cassette: SRAM XX1 Eagle 12-speed 10-50t. “I have been running SRAM Eagle for two years and love the gear range that it offers. It also enables me to run a larger chainring in the front, which gives me a more useful range of gears. 22. Saddle: Specialized S-Works Phenom, 155mm. 24. Cables and housings: SRAM. 26. Waterbottle cage: Specialized S-Works Zee cage. 27. Shock: RockShox Brain proprietary. 28. Stem: Syntace Megaforce 2, 60mm. 29. Special touches: Carbon/Ti seatpost collar, carbon/Ti headset top cap and alloy bolt. 30. Extras: SRM PC8 head unit. 31. Head angle: 69.5 degrees.